Last year, I had the privilege to test recipes for a vegan, gluten-free and allergen-free cookbook that featured low-glycemic recipes. And now, I have the great pleasure to see that cookbook in print, to hold it in my very hands, and to share it with you today! 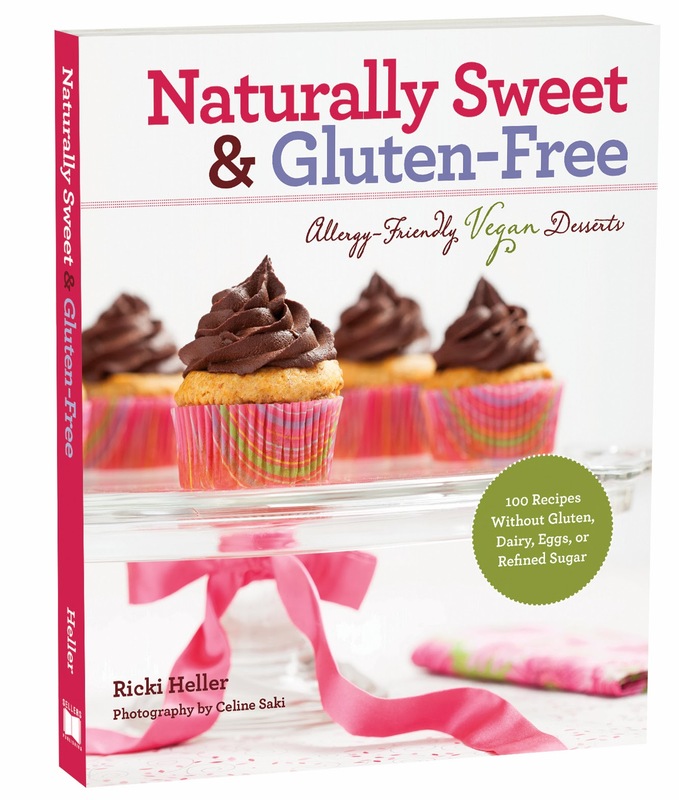 The cookbook I'm talking about is Naturally Sweet and Gluten-Free by Ricki Heller, the wonderful author of one of my very favorite blogs, Diet, Dessert, and Dogs (now known as RickiHeller.com). The book is absolutely beautiful. It's full of full-color photos of practically every recipe, and it is set up nicely so you can immediately choose the recipes that fit into your diet restrictions. Each recipe comes with a little paragraph from Ricki, describing her inspiration for the recipe or a fun story about how the recipe came about. The recipes are delicious and, after sharing them with friends and family, absolutely crowd-approved. You definitely can't go wrong having this cookbook in your home. I got to ask Ricki a few questions about her website, her diet, and the wonderful book. Here were her great answers! 1. What prompted you to create your website? It was sort of an impulsive decision. I’ve kept a diary since I was about ten, so I was already accustomed to writing on a regular basis. I was also beginning to really pursue work as a freelance writer at that time. In addition, I was on vacation from work, and we had just moved to a new neighborhood; I guess that events just seemed to conspire to provide some free time, finally, to focus more on my writing! I had heard about food blogs and wanted to chronicle my own culinary experiments as well as my repeated attempts to lose weight, so I thought starting a blog called Diet, Dessert and Dogs might be a good idea (to focus on the three main obsessions in my life at that time). I quickly realized how much I loved blogging and meeting all the amazing people in the blogging community—and I was hooked! 2. How long have you been eating a vegan, ACD diet? Actually, those two types of diet aren’t necessarily the same thing, so the answer is different for each. I started following what was essentially a vegan diet when I was around 17 or 18, though I had no idea that was what it was called at the time—I just preferred to eat plant-based foods. I went in and out of the vegan diet over the years, depending on whether I was living at home with my parents or not. Then, in my 30s, I was diagnosed with candida overgrowth and told to go on a strict anti-candida diet (ACD). Shortly thereafter, I studied holistic nutrition, which led me to understand more about both candida and what constituted a “healthy” vegan diet—and I quickly realized that my previous diet had been incredibly UNhealthy! With my knowledge of nutrition and how to battle candida, I devised a new diet for myself that would be both nourishing and healthy, one that would maintain my physical well-being as well as prevent the candida from coming back as it had before. I’ve been following that kind of diet for almost 15 years now. 3. How did you come up with the recipes for Naturally Sweet & Gluten-Free? What’s funny about this book is that, originally, it wasn’t going to contain any new recipes at all—the publisher’s original idea was simply to reprint my first book, Sweet Freedom. When I learned that they intended to market it as an allergy-friendly book, I suggested that we convert the recipes so that they were all gluten-free (they were already egg- and dairy-free). Then, since I was already following an anti-candida diet, I suggested that we make everything low glycemic as well. I ended up completely revising about half the recipes from the first book, essentially creating new versions that were both gluten-free and low glycemic. I also added some of the most popular recipes from my blog, and a few completely new ones as well. Honestly, I don’t need much of a nudge to go into the kitchen to bake; it’s one of my favorite activities. I find it fun to create new things, the way I used to find it fun to draw and paint, makepottery, knit or sew. For me, recipe creation is a great way to get away from the computer and writing all day (which is what I tend to do with the rest of my time!) and lose myself in something that doesn’t require intellectual thought. If I am bored, or sad, or happy, or feeling worried about something, recipe creation is kind of like my therapy: I can immerse myself in the activity and become so focused that I don’t really have time to think about anything else. As for recipe inspiration, I find I pull ideas from all sorts of places: magazines I read, other cookbooks, blogs, good restaurant meals, my childhood and the recipes my mom made. 5. What's your favorite recipe in the book? My favorite meal is, hands down, breakfast, so for me, at least one of the pancakes shoulddefinitely be on this list. I love the Fluffy Fruited Pancakes (and I’d say those are my hubby’s favorite), but I also love to recommend the Carob and Buckwheat Pancakes with Chopped Almonds and Chips because they’re guaranteed to change the minds of any skeptics who think they don’t like carob (or buckwheat!). And with our Thanksgiving holiday just passed here in Canada (and the US one on the way), the Chocolate Pecan Pie also comes to mind. It’s like a rich, chocolate ganache infused with pecans in a flaky pastry crust. Great for any time, actually! Finally, the recipe I mention most often as a favorite must be the Allergy-Friendly Chocolate Buttercream Frosting. It’s not only smooth and rich, pipe-able so you can decorate with it (and it retains its shape at room temperature), but it’s also free of sugar, butter, eggs, dairy, gluten, nuts, soy and corn. In other words, it’s suitable for just about anyone on any special diet. That’s the frosting you see on the cupcakes that grace the book’s cover, too. I could go on (I haven’t even gotten to the brownies yet! ), but I’ve already given you three extrarecipes, so I’ll stop there! 6. If you were stranded on a desert island, what one kitchen tool/gadget would you want to have with you? Well, I suppose if I were being totally realistic, I’d have to say a knife. Otherwise, how would I open those coconuts, build that hut, and defend myself against the wild macaques? If I assume I have the necessities (um, like electricity! ), I’d say it has to be my food processor. A day literally doesn’t go by that I don’t use it. I make nut butter, I mix cookie or cake batter, I puree sweet potatoes or kabocha squash, I mix up oat flour—all kinds of things. Plus, we use the processor every day to mix up the veggie portion of The Girls’ dinner. I love my blender and my mini processor, too, but use them just a bit less than the big processor. 7. What's one recipe/food you've been wanting to de-gluten and veganize but haven't yet? Hmmm. . . I have to say, I don’t feel as if I’m missing anything that I truly loved and wanted to re-create at this point. There are some dishes I’d like to try just out of curiosity, though, such as vegan meringue or a soufflé. And I haven’t attempted my own version of a gluten-free bagel yet, mostly because I don’t “do” yeast breads. But that might be one to add to the list! 8. What advice do you have for folks just starting out on a vegan, ACD diet? I think it can be devastating to learn that you have to alter almost everything in your diet, and most people (myself included, when it first happened to me) get caught up in how hard it will be or how much they think they’re going to miss their favorite foods. I think it’s important to approach the new diet as an adventure—like learning a new language or trying out a new cuisine—and also to keep it in perspective. We are very focused on food in North America (and most Western countries), so we sometimes believe that food is THE most important thing in our lives. I have to remind myself that isn’t so; I can still nourish my body quite well, thank you very much, with the foods I’m allowed to eat; and I can still enjoy the company of my family and friends, even if I’m at a social occasion and (gasp!) I don’t eat a single thing. Having said that, I really want people to know that this diet is truly not as tough as they may believe it will be, and they CAN continue to enjoy their favorite foods or share good food with family and friends. It may take a little adjustment period, but like anything else, you’ll learn to cook with gluten-free flours, with sugar alternatives, and yes, even without milk chocolate (see my answer to the next question!). As I mentioned above, I’ve been able to recreate pretty much every dessert or recipe that I love with alternative ingredients that are acceptable on this diet. And when I have people over for dinner, or when I join my family for holidays, I don’t feel deprived. I bring something delicious that everyone can share, and don’t even tell people that this is a “special diet” recipe. To their minds, it’s just something that tastes great. If you’ve just started the diet, I think the best thing you can do is seek out one or two established experts whose work you trust, then use their recipes exactly as published for the first while. 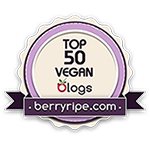 There are so many fabulous gluten-free and/or vegan blogs and cookbooks out now that it’s really not difficult to find them! Once you get a sense of the different ingredients, what you like and don’t like, and so on, then you can begin to experiment and perhaps even begin to create your own original recipes, or adjust old favorites to comply with your new diet. 9. What's your favorite ingredient to bake or cook with? This one is a no-brainer for me: CHOCOLATE! I guess that’s a pretty standard answer, but I am just such a chocolate lover. Cookies, cakes, pancakes, muffins, smoothies, shakes, frostings, pies—even on its own—is there anything chocolate can’t do? And now that I’ve discovered raw cacao as a result of the ACD, I love it even more. I never thought I’d be someone who made my own chocolates, but that’s something I do regularly these days. And chocolate is even good in savory recipes, like moles or chilis. You can purchase Naturally Sweet and Gluten-Free from Amazon.com. Disclaimer: I was provided with a copy of the cookbook, but the opinions expressed here are my own.